Plumas Audubon Society offers free bird walks in the next few months with Audubon volunteers as tour guides. PAS partners on some trips with staff from Feather River Land Trust. Bring water, snacks, sturdy shoes and dress appropriately. Saturday, April 20: A guided field trip to the beautiful Roberti Ranch in Sierra Valley. Tour will include a barbeque lunch. Space is limited and advance reservations are required. Call Jill Slocum at 414-6438 to reserve a space. Meet 9:30 a.m. at the intersection of highways 70 and A-23. Absolutely no dogs. 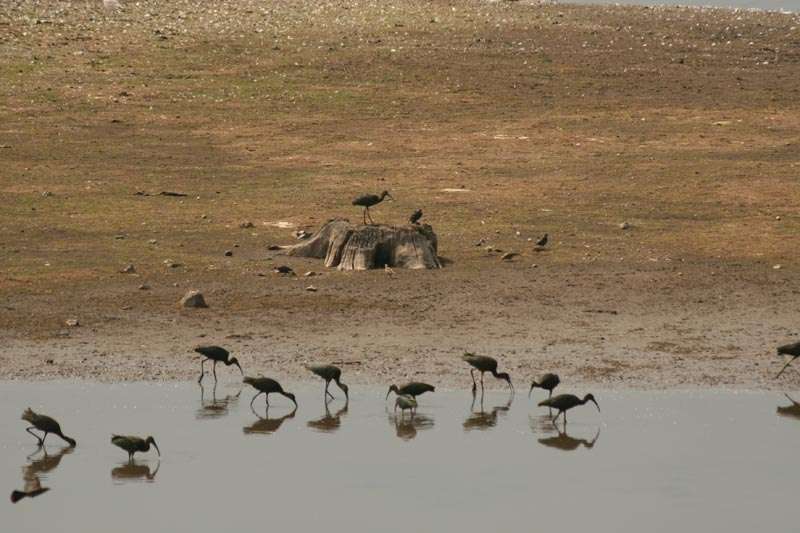 It is very difficult if not impossible to see the “white face” on the white-faced ibis. This bird will be found in a wetland or marshy habitat and since it is almost two feet tall, it will be easy to spot. A long, down-turned bill and long legs will help to identify it, and it will look brown from a distance. But in sunlight the feathers take on a purple and green sheen that is truly beautiful. They are often seen in flocks. Sunday, April 28: “Four Directions of the Compass Birding” led by Bob Battagin. Meet at 8 a.m. at the junction of Quincy Junction Road and Chandler Road, with the walk visiting open fields, barnyards, oak trees, bird feeders and a farm pond. Plan on seeing woodpeckers, finches, sparrows, orioles and hummingbirds. All four directions at this intersection offer excellent birding opportunities. Explore bird-friendly habitats for a morning foray ending 11 a.m.
Saturday, May 4: Spanish Creek Bird Walk led by Brad Graevs. Bird watch along Spanish Creek to the community service district water treatment ponds. Meet in parking area next to tennis courts in Gansner Park, 7:30 a.m. – noon. Saturday, May 11: Plumas Audubon bird walk led by Bob Beckwith in Genesee Valley riparian area. Meet in Taylorsville at Young’s Market at 9 a.m.; ends around 1 p.m.
Saturday, May 18: Plumas Audubon walk in Spanish Ranch, Meadow Valley, led by Darrel Jury and Darla DeRuiter. Meet at 6669 Bucks Lake Road, 7 a.m. From Quincy, this house is on the right side, two houses past the Pineleaf intersection. 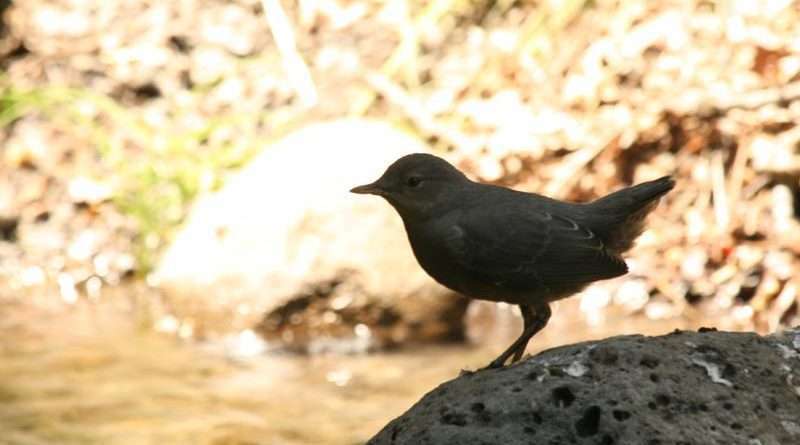 The walk will end around 10:30 a.m.
Saturday, May 18: A Feather River Land Trust bird walk, the Dawn Chorus in their Sierra Valley Preserve. Trip begins 5 a.m. Led by Kristi Jamason. Visit www.frlt.org for more information. Saturday, June 1: Bird walk and conservation talk at the Mountain Meadows Gateway property in Westwood led by Nils Lunder. Details are not yet finalized, but this is a celebration of land acquisition for the public benefit. Contact www.frlt.org for more information. Saturday, June 8: Sierra Valley Bird Watching led by Colin Dillingham. To carpool from East Quincy, meet in front of SavMor at 7:30 a.m. In Sierra Valley, meet in the parking area across from the A-23/Hwy 70 junction at 8:15 a.m. Spring birding at its very best! Bring your lunch. 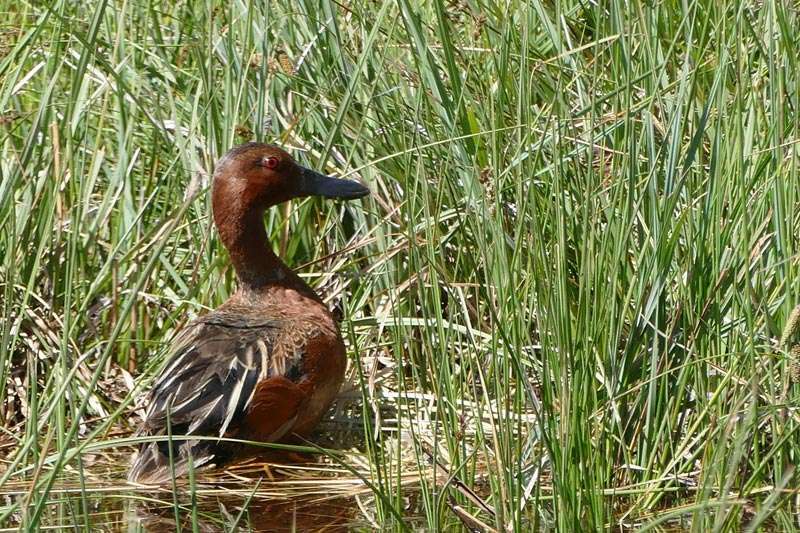 A cinnamon teal male is a sight to behold with its ruby-red eyes and bright cinnamon-colored plumage. Look carefully in the Spring and you will probably see its duller colored (mottled) mate close by. Teal are small ducks, and both female and male will show off a pale blue patch on the wings (speculum) as they fly. They are especially common in the alkaline marshes of the Great Basin during breeding. But in the Spring (now) look for cinnamon teal in any wet areas as they migrate through our mountainous region. Saturday, June 15: Boyle Ravine and Dellinger Pond led by Scott and Amber Edwards. Meet at 9 a.m. at Dellinger Pond on Bucks Lake Road where we’ll bird the pond and meadow edge before heading over to Boyle Ravine to look for riparian species. Bring water, snacks and mosquito repellent. Saturday, June 29: North shore Lake Almanor led by Suzanne McDonald. Meet on Highway 36 east of Chester’s causeway at the Last Chance Campground turn-off, across the street from Northshore Campground; 8:30 a.m. – noon. Carpool from there. Saturday, July 13: Bucks Lake Bird and Plant Walk led by Scott and Amber Edwards. Meet at Mill Creek trailhead at 8 a.m. When coming from Quincy, the trailhead is on the right side of Bucks Lake Road, 0.3 miles past Whitehorse Campground. Bring a pack with lunch and drinks if you wish to participate in a group picnic on the lake shore. For more information about these bird walks, call Suzanne, 375-0199. The public is also welcome to join the Audubon Christmas Bird Counts from Dec. 14 to Jan. 5.